One can say – with caution – that the spirit of Christmas has been overshadowed by the spirit of shopping for Christmas. If you feel you miss that good old Christmas vibe of jingle bells and streetside carrols, then this post is for you. We chose to focus on two destinations, one obvious and one that you may find surprising. But both these cities offer the Christmas experience of days long gone. Sometimes all you need is a bit of nostalgia to warm the heart. 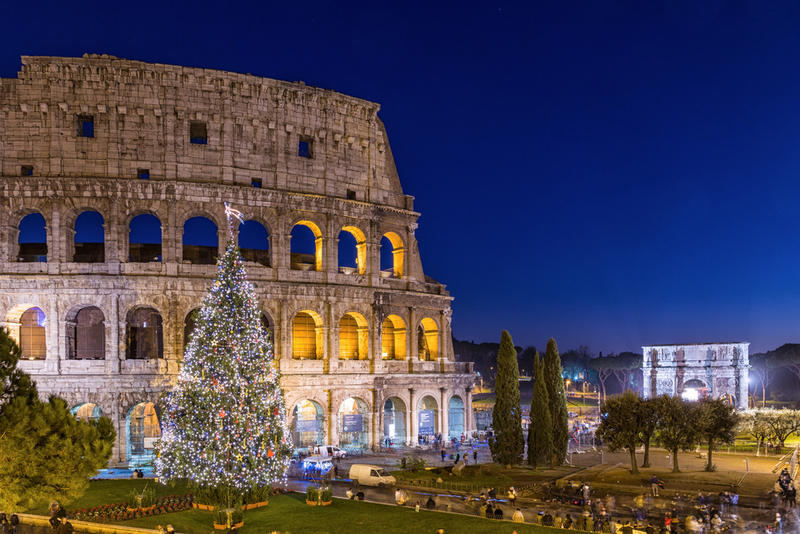 We can’t think of a more appropriate destination for Christmas vacation than Rome. As the core of Christianity, a visit to Rome guarantees an unforgettable experience. Similar to Jerusalem and the nearby Bethlehem (which we covered in our last post), a Christmas holiday in Rome is meant for the those looking for a profound spiritual experience. The Nativity Scene is warmly embraced by Italians to this very day. One of the most popular events in the city is the 100 Presepi, a huge exhibition of hundreds of cribs from all over the world in a wide variety of styles and materials. If you’re into the traditional spirit of Christmas, this is a big must. For fans of classical music (we’re assuming some are still left) here are two can’t-miss events. Internationally acclaimed musicians perform opera favorites like “La donna è mobile” from Verdi”s Rigoletto, “Vissi d”arte” from Puccini”s Tosca and beloved Neapolitan piano classics like Chopin”s “Heroic” Polonaise. After the performance, you also get to mingle and drink with the artists. If you’re familiar with these operas, you know it’ll be a shame to miss this live performance in the historical setting of Rome. If you don’t – well, that’s your chance to broaden your musical horizons. A wonderful performance of baroque masters as Palestrina, Agazzari, Pitoni, Morales and many others. The concert takes place inside the wonderful Capuchin Crypt and afterward there’s a guided tour – in English – of the crypt. Not for the faint of heart, as the crypt houses the skeletal remains of some 4000 individuals buried by the order. It’s a powerful scene down there, with real skulls covering the walls of the cave-like space. We can list dozens of events in the Vatican during this festive season, but we feel that would be like preaching to the choir. It’s the Vatican; just the thought of attending midnight mass there – alongside a few other believers – is riveting in itself. There are quite a few other papal masses in St. Peter’s Basilica and St Peter’s Square and as it is the Vatican after all, all tickets are free. Still, and especially because of that, you better hurry up and book your tickets in advance. Important to know: Tickets DO NOT necessarily guarantee entrance or a seat. When the church / Square is full access will be denied even with a ticket. Only an early arrival time will guarantee access – so make sure to come early. Continuing our musical theme, Dublin is another inspiring place to enjoy Christmas tunes. Needless to say, there are plenty of Christmas trees all around, magical illuminations and loads of markets, but we feel that what sets Dublin apart are the gorgeous and clear Irish voices. The Order Of Malta is putting on two performances of A Christmas Carol by Charles Dickens. Perhaps the most heartwarming Christmas story of all time, it is the perfect festive entertainment with Ebenezer Scrooge’s misery finally finding redemption as he is visited by the ghosts of Christmas past, present, and future, on a snow-swept Christmas Eve. The perfect way to celebrate Christmas for the entire family. Anúna, Ireland’s most esteemed acapella vocal ensemble, performs every year at Christmas and their concerts have become the quintessential holiday season event in the city. This year will feature a selection of seasonal music including much-loved classics and gorgeous staging of hundreds of candles. Fast-forward a few centuries, the ever-so-urban Smithfield Square hosts an acoustic evening featuring school girls from Stanhope Street Secondary School, David Keenan, the young singer/songwriter from Dundalk, Sinead White – a rising star of Irish music and Jerry Fish and Band will pick up the paste into a swing. Following the show will be a lighting ceremony, as tradition demands. This is yet to be confirmed, but organizers are promising a special visit by Scruffy The Reindeer, taken he’ll make it all the way from the North Pole. Dublin looks like a magical place to spend Christmas.